My name is Ai Lisa. I am a 34-year-old Japanese female. I used to live in Los Angeles California for 7 years. I learned cooking from my mother who used to own a Bento (lunch box) shop, and grandmother who is the owner of a Japanese style hotel and chef. Food is a huge part of culture, and I am a big food lover! I want to share my passion for food and cooking with you! She's really nice. Funny, warm and food is tasty. We took many food pictures. I've learnt it and my friend is a good photographer. She is a good communicator so we really enjoyed! We had a great time learning to cook Japanese dishes with Ai! A highlight of our trip to Japan. We cooked teriyaki salmon, fried lotus root cakes with dashi sauce, and ton jiru (pork and vegetable miso soup). Ai's directions were really clear and simple, she is a great teacher. The final meal was very delicious and we think we will have no trouble recreating it again back home thanks to Ai's careful instruction and provided recipes! After lunch Ai took us to a nearby supermarket to show us what we would need to buy to make the dishes. While we were there she also helped us with a couple of other supermarket items we needed - help we certainly needed and greatly appreciated. Ai herself is lovely and a great host. She is the kind of interesting and dynamic person with whom you could easily talk for many hours. When she learnt that we were on our honeymoon she made an effort to congratulate us. It was truly heartwarming and we'll never forget it! 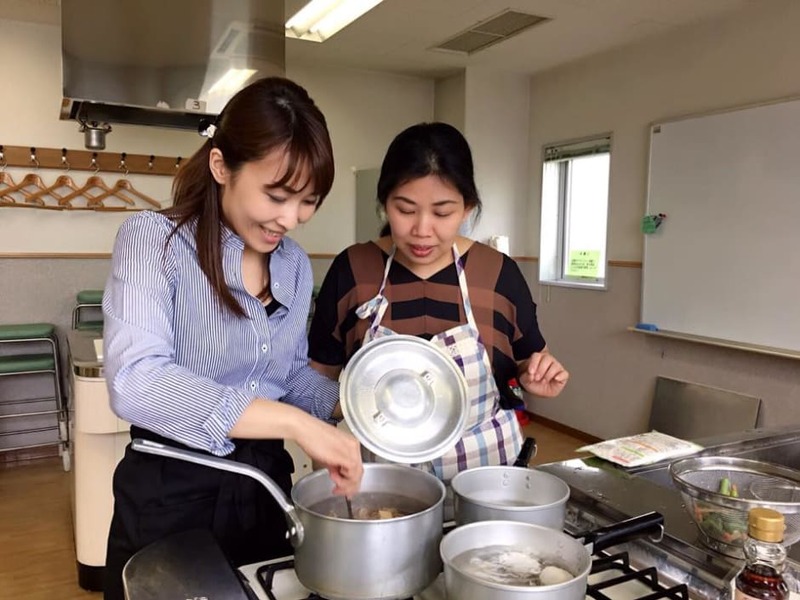 If you're in Tokyo and you like to cook and meet new people, book a class with Ai. You'll love it! What an incredible class we had! Ai was great at communicating with us before the lesson, agreeing to customize the menu to include a newfound favorite of ours--nasu! She also gave very clear instructions about where to meet her and she was exactly on time, despite the dreary weather. Fortunately, the cooking studio was barely two minutes' walk from the station! Ai gave us a few small jobs to do early on, but the real value in the course came from the hands-on technique instruction in how to make the perfect sushi rice (my rice-cooling technique was all wrong! ), and how to prep the eggplant for frying. We also learned how to make dashi, and Ai carefully explained the ingredients used and the variants we might see in U.S. grocery stores. Because we had made sushi previously, Ai gave us a more creative, thick roll, with several new-to-us ingredients inside. Thanks to her excellent advice, I was able to locate mitsuba (kind of like Japanese parsley) back home! We also learned how to make dashimaki tamago, and Ai advised us about the perfect amount of dashi to use to add flavor but maintain enough structure to roll. After we enjoyed our creations (along with a delicious sake that Ai brought us, of which we bought several more bottles during our stay! ), Ai took us to a nearby market so we could learn a little more about Japanese produce. She was extremely patient with us, allowing me time to snap pictures of products she recommended, and answering our myriad questions. All three of us had a fantastic time, and not only would I heartily recommend Ai's class to someone else, I would also take a class from her again next time I'm in Japan! She is a fantastic teacher and an incredibly warm person...getting to meet her was a true joy and one of the highlights of our trip! Not in a million years would I have thought that I can make my own sushi..
Lisa met us at the Roppongi station, welcoming us with a warm, friendly, smile. Lisa spent some time in Los Angeles, her English is perfect, which was great, now, we can focus on the cooking .. Yes Folks, we made all these. Lisa is very passionate about the Japanese culture, and it shows, she explained about traditional cooking, the preferred taste for the Japanese palate, we also talked about Tokyo, and its history, all while chopping, heating, and cooking. the cooking took us about 2 hours, we then set the table, Lisa brought a bottle of sparkling Sake, we got a six pack of Asahi beer, and we started eating. The food tasted great, Lisa put together a winning menu, every dish was a hit, most notable are the Sushi, and Fried Eggplant. After we finished the meal, and had great conversation, we stayed around to help clean a bit, and off we went to Karaoke, just down the street. In Summary: A Fantastic experience, I have to rank this experience as one of the biggest highlights of my trip. I learned a lot, I had great conversations, we laughed a lot, all while eating amazing food that we created together... Thank you Lisa, thank you Voyagin. Our hostess, Lisa, could not have been more gracious and accommodating as well as a superb chef. Her warm welcoming of us was the perfect opening for a fantastic evening. She had planned a delicious meal that took into consideration that we, amateurs, would be participating in the prep. Lisa let us set the pace for our involvement- she had some early prep completed and let us be as involved or not as we chose. Loved the aprons we all wore. It was fun wrapping the Gyoza Dumplings. I never quite conquered the pinch but my husband and son came to my rescue as did Lisa. Presentation, jazz music, delicious food and the flowing conversation made the perfect evening.